I have been part of the Desert Ecology Research Group since 2007, when I undertook an honours research project looking at plant-pollinator interactions in the Simpson Desert under the supervision of Associate Professor Glenda Wardle and Dr Yvonne Davila. As with most research, many more interesting questions came to my attention, so I began doctoral studies on the same subject in 2009. The main research objective of my PhD was to understand how flower-visitor networks change in time and space in response to rain-driven resource pulses. I also have an interest in native pollinators. My work is one of the most comprehensive surveys of arid zone flower visiting invertebrates in the country, and has uncovered many new species previously unknown to science. Among the bees alone, about 30 new species (30% of the bee fauna) have been discovered. The challenge still remains to document the diversity of the vast arid zone of Australia. I have a broad interest in arid zone ecology and conservation, and the life history strategies and behaviour used by flora and fauna as a means to survive in such an extreme environment. Being a member of the DERG has given me experience and enabled skill development in areas outside of my own specific research. Popic TJ, Wardle GM, Davila YC. 2013. Evaluation of common methods for sampling invertebrate pollinator assemblages: net sampling out-perform pan traps PLoS One 8:e66665. Popic TJ, Wardle GM, Davila YC. 2013. Plant-floral visitor networks only partially predict the function of pollen transport by bees. Austral Ecology 38:76-86. Batley M, Popic TJ. 2013. Five new species of Leioproctus (Protomorpha) Rayment (Hymenoptera: Colletidae). Records of the Australian Museum 65(2): 39-50. Popic TJ. 2010. Native Bees. In: Desert Channels: The impulse to conserve eds. Robin L, Dickman C, Martin, M. Pp 110-111. CSIRO publishing, Collingwood, Victoria, Australia. Popic TJ, Davila YC, Wardle GM, 2013. Talk title: Pollination networks: dynamic responses to rain-driven resource pulses. EcoTas conference: Joint meeting of the Ecological Society of Australia and The New Zealand Ecological Society, Auckland, New Zealand. Popic TJ, Davila YC, Wardle GM, 2012. 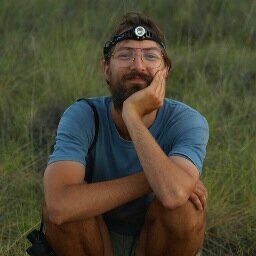 Talk title: Robust sampling yields new discoveries and informs pollination of Simpson Desert plants. Ecological Society of Australia, Melbourne, Australia. Popic TJ, Davila YC, Wardle GM, 2011. Poster title: Small mammal florivory of nectar rich Crotalaria cunninghamii. Ecological Society of Australia, Hobart, Australia. Awarded the ‘Most outstanding poster presentation’. Popic TJ, Davila YC, Wardle GM, 2010. Talk title: Plant-floral visitor networks only partially predict the function of pollen transport by bees. Ecological Society of Australia, Canberra, Australia. Popic TJ, Wardle GM, 2010. Talk title: Extremes: Understanding flower – visitor interactions in a changing climate. Forum: Wildlife and climate change: towards robust conservation strategies for Australian fauna. Held by the Royal Zoological Society of NSW, Sydney Australia. Popic TJ, Davila YC, Wardle GM, 2009. Talk title: Plant – animal pollination interaction networks in arid sand dune habitats. Forum: Renaissance in the Desert: Ecology of Bush Heritage’s Simpson Desert Reserves, held by Bush Heritage Australia, Melbourne, Australia. Popic TJ, Davila YC, Wardle GM, 2008. Talk title: Pollen transport by native solitary bees in an Arid Australian pollination network in the absence of Apis mellifera. Ecological Society of Australia, Sydney, Australia.